I am looking to get a T5 fixture for my new 65gallon setup 36x18x24. I want to eventually make it into a mixed reef tank. Would I be better with a 6 or 8 39W fixture? Also I was looking at the ATI PM or SP fixture which one is better in your mind and does the upgraded dimmable ballast worht it? The combo seems to be rather harsh with the daylights on, should I replace the order of the bulbs? or maybe replace the aquablue or purple + with something else? With the timer on this fixture kinda limited on bulb placement for dawn/dusk.... Keep mainly SPS, some LPS and would like to add a clam soon. BTW run the lights- 2 hours- 2 blue+ in the morning, then 8 hours of all lights, then another 2 hours of 2 blue + in the evening. Replace the Aquablue with a KZ new Generation or another blue plus. America, the way it outta be! Visit The Grim Reefer's homepage! Ok, 6x24w ATI Sunpower over 36g 24'' tall tank going to be mixed sps lps reef with sps at top and clam in sandbed. Morning KZ and B+ for 2hrs then all for 8 and evening B+, B+ for 2hrs then moonlights. Think I got it but want the boss' (Grims) approval. And I'm thankful on this Thanksgiving day for all you have done for countless people on this board THANK YOU!!!!! As long as you like the look it's fine, thats all that matters. Glad this post is still going. I just got home from Iraq and its time to Replace the bulbs. Right now im running a 6bulb 54 ati powermodule setup with 2 vho's. I was wondering what bulb configuration i should go with. You helped me last time but since then I added 2 Vhos (actinics) but its time to replace them all. Can you help me with what i should buy and what order they go in? The 2 vhos go at the end with 1 on each side. Happy thanksgiving! Glad you got home for the holidays, thank you! With the VHO actinics I'd do 4 Blue Plus, 1 Purple Plus and a GE 6500K in the powermodule. 6 lamps is enough. Either fixture will do fine. Hi mr Reefer, how would it be best to arrange the replacement bulbs of 6 t5 14k(marine white) and 2 420nm(marine blue) bulbs to get a bluish look? Or should I make it a 4 white 4 blue combination? I have a 42" x24" x 24"tall SPS dominated tank. Disclaimer: I am not at all techie or the DIY type. I have a 72gl bowfront that's 21" deep and 17" from the back of the tank across to the bowfront. It has a 48" JBJ fixture that has been running 65w cf for about 7-8yrs. The plexiglass that covers the bulbs has cracked. I have mostly fish and some softies. I want to upgrade my lights and am not at all up to date on the new technology. I am drowning in lighting threads and my brain hurts. Do i need to get an entirely new fixture to upgrade to better lights? 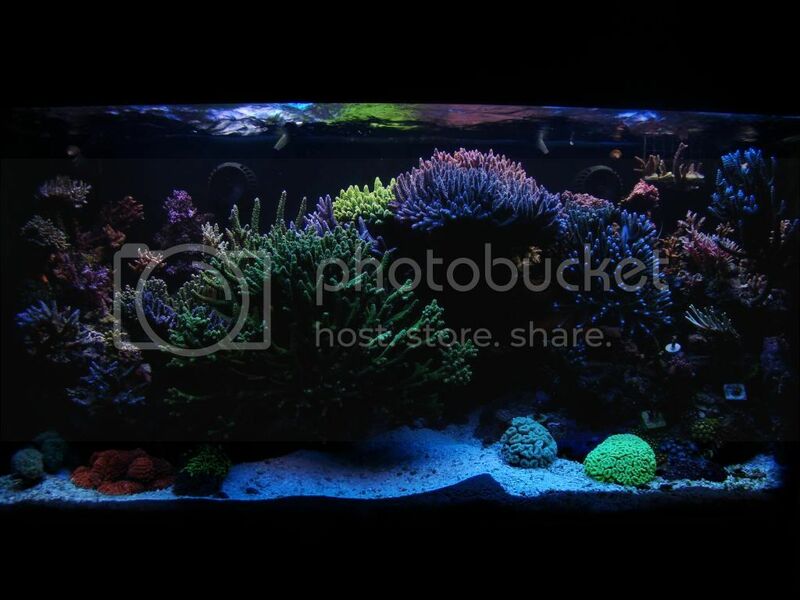 I was looking at this: http://www.marinedepot.com/Coralife_...FIT54U-vi.html I want to be able to put more corals into the tank. I really want to add some ricordia and other very colorful coral to the tank but don't want to kill them with the lousy lights i have now. My mushrooms are doing 'okay' as are my polyps but i really want to expand. All thoughts appreciated..but as i said, i am 'older' and not very techie and the not well-versed in the terminology. THANKS! I am hoping I could get some help on what bulbs to choose from the selection Reefgeek has on their site. Im aware this might be tough since its possible not all the owners lights are on but Im hoping for as much help as possible. What's the difference between the KZ super blue and ATI Blue+? 420 front and rear is going to be the best you'll get. 6 Blue Plus and 2 Purple Plus wil get you close. Maybe even even 1 Purple Plus, 5 Blue Plus and a couple Actinics. Other than the price the ATI has more PAR. I can't realy se much color difference. From the picture it is realy hard to tell real color since no camera renders color 100% as the human eye sees it. I also do not like the fact that there is so much drop off from top to bottom, and think they need more lighting on this tank than what the picture shows. For lighting this and getting close I would use all ATI bulbs with 1 Purple Plus, 1 Aqua Blue Special, and the remaining 6 bulbs as Blue Plus. But your light intensity will probably be a lot more than what is in the picture. These two bulbs are extremly simular with the possibility that the real difference is in the marketing. If you look at the mfg claimed specs the ATI bulb peaks at 450 nm While the KZ bulb claims to have two peaks one at 420nm and the other at 460 nm. If you were using these as stand alone bulbs you might see some difference but I seriously doubt it because the eye can barely detect light at 420 nm, and it very hard to see a difference between 450 nm and 460 nm. Besides that the normal manufaturing consistance between batches of these bulbs could easily be wider than any difference betwen these two bulbs. Where did you find a spectral graph for a KZ bulb? I don't recall seeing graphs for any KZ bulb as they hide all of their information. Hey guys, I need help choosing my lights. I have an Aquatintics TX5 fixture. This fixture has 5 36" 39 watt T5 bulbs, and I need help choosing what to put in there. My tank is a 30g with 10g sump. I am going to start with a just clown and then start adding some soft corals after a few months. After my tank is established, I might want to try to LPS or SPS corals, but this is not 100%. Any personalized suggestions you guys can give me? Yes..thank you...you did answer my PM and i appreciate it but we can't have a 'hanging' fixture. I am about to get the fixture in the link i posted but it comes with lights...i need to know if the bulbs you recommended can be used in this fixture...or if i am going to be stuck with the 10k and blue that it comes with. THANKS! I have an 8 bulb 36" 39w AquaMedic fixture, going to replace all the bulbs. Here's my idea of a good configuration. I like my tanks a little more on the blue side. Comments or suggestions? Tank is a 46g bowfront housing lots of LPS and will have some acros at the top. I wouldn't buy that fixture. If you must those lamps should work in it fine as far as I know, it is a 54 watt fixture.